UNITED KinKdom: Channel 4 Hair Casting Alert!! 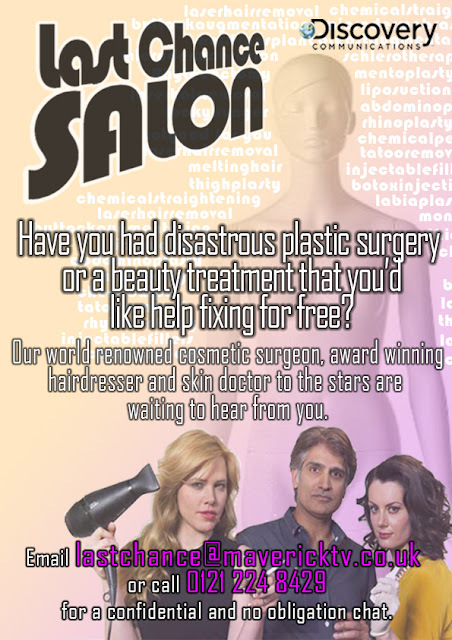 Channel 4 Hair Casting Alert!! Hi guys I've recently been contacted by Maverick TV, the makers of Channel 4's hit show "Embarassing Bodies" who are now casting for people to take part in their second series of "The Last Chance Salon". "Did a trip to the hairdressers leave you with the hairstyle from hell? Maybe it’s a DIY beauty fix which has left you unhappy and wishing you'd gone to the professionals? Our world renowned cosmetic surgeon, award winning hairdresser and skin doctor to the stars are waiting to hear from you. This is one beauty appointment you can't afford to miss." I just read from beginning to end the entire article of yours and it was first-class. This is a great article thanks for sharing this informative information.